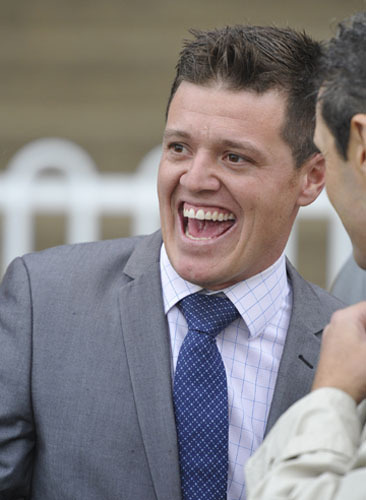 About the only person not surprised by the win of Reiby Rhymer at bolter’s odds of $101 at Bathurst on Tuesday was her trainer Jason Attard. A seven-year-old mare who hadn’t been placed in 15 previous starts but having only her third start for her new trainer, Reiby Rhymer (Winona Costin) led throughout in the Maiden Handicap (1300m). “I expected her to run well and gave her a top-three chance,” Attard said after clinching the longest-priced winner of his career ($120.70 on NSW TAB). Her win was a great result for her owners Sid and Carolyn Kelly. Sid Kelly, the popular Hawkesbury Race Club vice-chairman, and his wife had almost retired Reiby Rhymer after she failed in 13 starts for another trainer. She finished last at the Gosford picnic meeting in December of 2017 and earlier had an uncompetitive warning placed on her by stewards after a 21-length last at Hawkesbury in April that year. Reiby Rhymer subsequently came home to the Kelly’s Reibycroft Stud where Attard stables his horses. Attard said the mare finished a close second in a 1000m barrier trial on her home track on December 7 but his excitement turned to disappointment when she finished 11th of 12 in a Hawkesbury Maiden (1100m) nine days later. Attard then took Reiby Rhymer to Orange for a 1400m Maiden Plate on January 8, and planned to ride her quietly. At Bathurst Winona Costin made the running on the mare to hold off another Hawkesbury runner, Noel Mayfield-Smith’s Hamish The Swift and the favorite Gemmahra. Reiby Rhymer was Attard’s fourth winner of the season. Husband and wife training team Mitchell and Desiree Kearney also notched their fourth winner of the season with Dynamic Dynasty (Adrian Robinson) in the Benchmark 58 Handicap (1800m) at Bathurst and Matthew Vella rang up his second winner of the season with Bad Boy For Love (Mitchell Bell) in the Class 1 Handicap (1300m). Dynamic Dynasty on his sixth race – and his third since joining the Kearney yard – when he humped 62kg to defeat The Long Run, to whom he conceded a whopping 10.5kg. Vella has done a terrific job with Bad Boy For Love who is raced by former trainer Colin Branthwaite and his wife Meagan. They operate Jazcom Thoroughbreds, a premium spelling and agistment property at The Oaks. Bad Boy For Love broke through in a Maiden on his home track on December 16 and subsequently humped 61kg when narrowly beaten in a Nowra Class 1 on January 14.